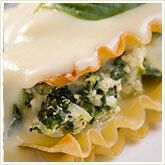 Home » Recipes » Healthy Recipes » Looking for An Idea for Dinner? Everybody loves lasagna, but we don’t love the fat that comes with that gooey mozzarella cheese. Here’s a great recipe that uses nonfat mozzarella for all the flavor without the fat, tofu for protein, and spinach for vitamins, minerals, fiber—and Popeye-approved yumminess! Preheat oven to 350 degrees. Place tofu in large bowl and crumble. Chop spinach, then combine in bowl with tofu, parsley, salt, and pepper; mix well. In bottom of a 4-quart rectangular baking dish, spread a layer of tomato sauce, then a layer of noodles, then a layer of tofu/spinach mixture. Repeat layering process with the remaining sauce, noodles, and filling until all ingredients have been used, ending with noodles covered by sauce. Sprinkle mozzarella over top. Bake for 45 minutes or until bubbly. Remove from the oven and let sit for 5 minutes before cutting. Previous post Having A Hunger Attack? Next post Who Won That Canon Digital Camera in WOWY?